In reality this post is a final attempt to get my blog to be featured on Foodgawker and Tastespotting while the Good Meat Cookbook giveaway entry period is still open. Don't forget that you have until 11:59 PM Eastern Standard time on Sunday February 27 to leave a comment on the Good Meat Cookbook Giveaway post to be entered for a copy of this amazing book by James Beard award winning author Deborah Krasner. I am not saying that these rice crispy treats are not tasty. Nor am I saying that they are not worth your time and energy to make them. I would have shared them eventually, but as they are photogenic I decided to share early. 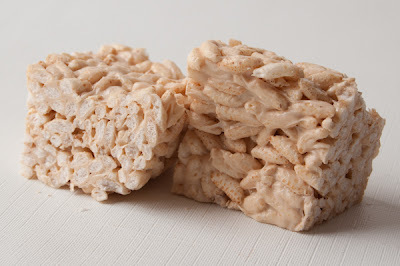 My mother never made rice krispie treats. As a woman who referred to iceberg lettuce as "junk food" and made a convincing argument for marshmallows being disgusting puffed sugar, it is really no surprise that she did not make them. Her description of marshmallows kept me from trying one until I was eighteen. I suppose to be completely honest I would have to say I never tried a plain marshmallow before I was eighteen. I probably ate my weight in rice krispie treats at every bake sale at my school when I was growing up. I never knew they contained marshmallows, but somehow they were an illicit favorite. Now that I have children of my own it is not my mother's brainwashing that kept me from making rice krispie treats at home. It is because marshmallows are really puffed high fructose corn syrup, not sugar. However the other day I found vegan marshmallows which are high fructose corn syrup free. When I brought them to the register the cashier told me how much she loves them. Then when she saw the whole grain rice puffs she said in an awed voice, "You're making healthy rice krispie treats." Personally I think they are less unhealthy or even healthier, calling them healthy is still a stretch. The recipe is from Smitten Kitchen and it is for Salted Browned Butter Crispy Treats. I figured if I was going to the trouble of buying better quality ingredients I might as well start with the best recipe I could find. While these are not health food they are rich, nutty and buttery. 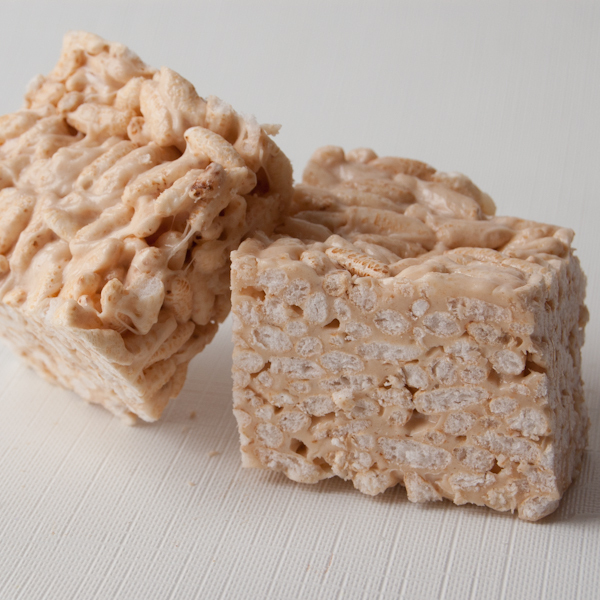 Tastier then your average rice krispie treat and with at least reduced guilt when you indulge. Butter (or coat with non-stick spray) an 8 x 8 x 2 inch pan (mine was pyrex). In a large pot, melt butter over medium heat. Continue to cook the butter over medium heat, stirring often, until it becomes golden brown and smells nutty, about 5 minutes. Don't walk away while you are browning the butter because butter can go quickly from browned to burnt. As soon as the butter is browned and fragrant turn the heat off and add the marshmallows, stirring them in well. Turn the heat back on to low and continue to stir until the marshmallows are completely melted and smooth. When I made them at first the marshmallows did not want to melt at all and I began to panic that healthier marshmallows don't melt. Eventually the mixture became melted and smooth. Once the marshmallow butter mixture is completely smooth turn off the heat and add the cereal and salt all together. Stir well and quickly spread in the buttered pan. Press the top down firmly with a spatula to make sure it is evenly spread in the pan. Allow to cool completely before cutting into squares. If it was up to me Robin, your picture would be posted at both FG and TS. If I make Rice Krispie Squares, I eat them non stop. Something very addictive about rice krispie squares. After looking at your picture I'm going to be craving them all day. Might have to cave and pick up a box of RK and a bag of marshmallows on the way home from work.